September 18, 2018 Dan O. This is what we need, right? It’s present-day America and its citizens are fed-up, to say the least. Unemployment is at a high, overpopulation is getting ridiculous, and crime is becoming a normal, everyday occurrence, leaving everyone to just lose their hope in America being the best country in the world. But that all changes when a psychologist (Marisa Tomei) proposes an idea that may change all of this: Allow for all crime to be legal on one night and have it be called “the Purge”. It’s a crazy idea for sure, but somehow, it works and in a way to test it all out, they use Staten Island as the guinea pig. And on Staten Island, everyone’s a little scared, like activist Nya (Lex Scott Davis) and her impressionable brother Isaiah (Joivan Wade), whereas others are happy and ready to take advantage of the fact that they can do whatever the hell they want for this one nigh, like local drug kingpin Dmitri (Y’lan Noel). But what begins as a possible safe-haven, soon turns deadly when it becomes clear that there are far more powerful powers at-play and want to see all of the poorest and weakest people perish on this one night. Dmitri 2020? Let me know! In all honesty, I have a very weird relationship with the Purge movies. As an idea, they’re a bit goofy, but they are also ripe with possibilities and the opportunities to do what few franchises in its same position are allowed to do. For instance, it can be as grimy, as gory, and as violent as it wants to be. It can also say something about the current political-climate where the more disadvantaged people in our society are thrown-out and in the line of fire, while the rich, mostly conservative, religious-right get the chance to soak it all up in. But as much as you’d think that the Purge movies would really jump on these aspects, they never quite reach their mark. The action is shoddy, the social-commentary is weak and easy, and the scripts never quite reach the insane-driven carnage-heights you’d expect. The movie’s may be rated-R, but they still feel somewhat tame and always held down by something. Turns out, that something may have been the original writer/director on the first three films, James DeMonaco. Of course, as both writer and director, DeMonaco did an okay job, but it becomes very clear that he was also what was holding this franchise back, once you realize that director Gerard McMurray is behind the camera this time and all of a sudden, everything seems to be working. Sure, the first-half is a little too slow and still stuck in that schlocky-feel from the first three movies, but once it actually gets going, the First Purge becomes the best and perhaps most important flick in the franchise. Does that mean a whole lot? Not entirely, but it still shows improvement for a franchise that, at three films in, didn’t seem like it was going to do much else except the usual killing, laughing and American flag-waving. But now, there’s actually a ton of gruesome and somewhat disturbing violence; social-commentary about America’s awful history with race and most importantly, POC’s; and even characters to give a hoot about, and who don’t just feel like silly-types we get in these silly action-thrillers. A simple fight over who’s got less hair. That’s all. But like I said, what works best about the First Purge is that its social-commentary seems to be incredibly on-point here. Sure, some of that may have to do with what’s currently going on in our politics, but for a silly movie about a night in which everyone basically goes around killing one another, there’s much more interesting stuff at-play. It’s a movie that discusses race in a frank-manner, in how once this Purge gets going, it becomes very clear how much of it was just a smoke-screen it was to get rid of black people, or as they call them here, “undesirables”, and to continue to make white people very happy. Honestly, it’s scary because we see that nowadays, making some of this hit a little too close to home, but also making the action sting and hurt harder than it ever has before. There are still problems with the First Purge and more often than not, I still find myself asking random questions by the end, but if anything, this is the step in the right direction that this franchise so desperately needed. Let’s hope they continue to get better, even if our politics don’t. In fact, let’s hope and pray that both do get better. Much, much better. 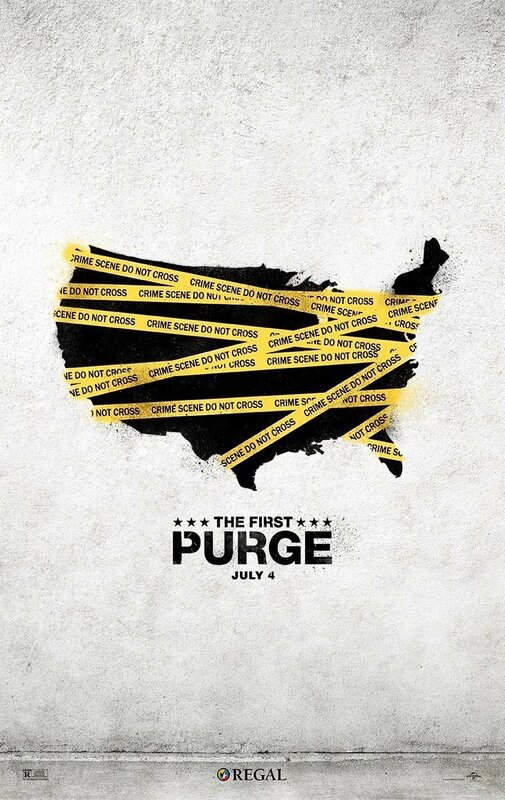 Consensus: While still suffering from the same silly mistakes of the first three installments, the First Purge is an interesting prequel that uses social-commentary to heighten its sometimes disturbing violence, as opposed to the other way around. Lessens the vision, but hey, whatever works.